Have you ever wondered what it would be like to live a real life adventure like The Goonies or Indiana Jones? Or what it would feel like to be trapped in a horror movie like 1408 or SAW? Brighton Asylum is proud to present the next generation in a growing trend of interactive games called “Escape rooms”! Brighton Asylum’s Escape Rooms in NJ are among the most interactive, immersive, and action packed in the New Jersey area. 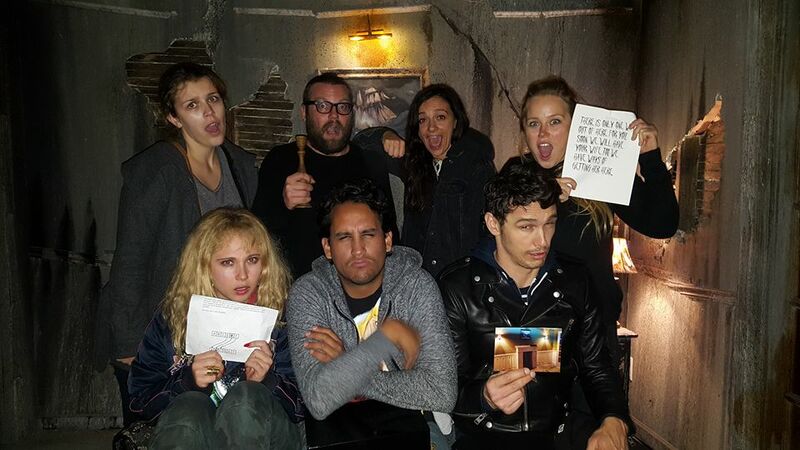 Our NJ escape rooms have been played by thousands of people, including actor James Franco. An escape room is a physical adventure game in which players solve a series of puzzles using clues, hints and strategy to complete the objectives at hand. Players are given 1 hour to unveil the secret plot which is hidden within the rooms. You must work together as a team, exploring your surroundings and racing against the clock using logic, critical thinking, and your gut instincts to find clues, solve puzzles, crack codes, find hidden passage ways, and uncover hidden secrets that will ultimately lead to your escape! If you are looking for an escape room in NJ, look no further. Book your escape room experience today. See below for more information about our rooms. Maximum group – 6 players. 1408 esape can handle 7 players. Please arrive 15 minutes before your scheduled time. All games start promptly at the scheduled time whether your group has arrived or not.